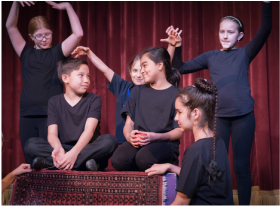 ﻿﻿﻿﻿﻿﻿﻿Spotlig﻿ht ﻿Musical The﻿atre Academy is ﻿dedicated﻿ to enriching the lives of children both on stage and off. ENGAGE in three hours of acting, singing and dancing classes every week. This is Triple Threat Training at its best! Our Center Stage Students rotate through these classes in groups of same aged peers, called Act I, Act II, and Act III. Our unique program focuses on teaching children, not material, with amazing results. ​﻿ENHANCE performance skills in this advanced training for highly committed teens. Courses are taught by some of Portland's top theatre professionals, and include in-depth training in a plethora of skills required for a career in the performing arts.